I'm not a big fan of yellow but as I was asked for it as it's a favourite colour I think it came together OK and it looks more lemon. Its an 8x8 card and I used Tattered Lace Chantilly petal for the doily look. Marianne Anna corner die first layer and Spellbinders vintage lace die for the inner doily. 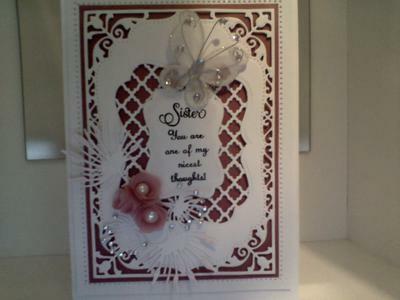 The Card for my Sister is in the hinged style using Christina's tutorial. I used Spellbinders Elegant labels 4. I cut out the middle and used Spellbinders lattice die behind it. Using a smaller labels 4 die I stamped and heat embossed my sentiment.the leaf/flower shapes are from Marianne and I gave them a bit of bling by putting ting gems on the fronds. The pink flowers I made from vellum using another Marianne die( they don't seem to have names) it's a wavy spiral though and put a pearl from my stash in the centre. I really enjoyed making this as my sister is such a lovely person and my very best friend. I was so pleased she loved it. Two very pretty cards and I am sure that both recipients loved them. I am not a lover of yellow either but this card is such a delicate pale lemon and it looks wonderful with all the lacy panels to it. 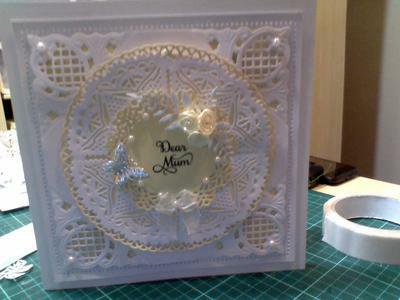 Spellbinders and Tattered Lace work so well together and the cards they create are a dream. I just saw these two cards and my first thought was OMG… these are drop dead gorgeous cards! You can certainly see the time and effort put into them and attention to detail. Very, very beautiful! Beautiful cards, I feel the same about yellow, but I will be using it in my cards, they are beautiful. Two very nice expensive looking cards, the colour doesn't matter as the delicacy of the work is prime. I'm making a trellis die card for the first time, and am quite excited about it. Thank you Rinda for taking the time and leaving your kind comment. what a beautiful card you have make.